We talk to the creator/writer/director of the critically-acclaimed THE BUNKER and discuss his journey from "Thomas the Tank Engine" to interactive horror. We also get a behind-the-scenes account of how THE BUNKER was made and how his company, Splendy Games, brought FMV to the Cannes Film Festival. Before Allan Plenderleith entered the interactive film arena, he'd already established himself in a 20-year career in several entertainment industries. Plenderleith is a screenwriter who started in advertising, then gained experience storyboarding, illustrating, and writing books. He found success writing for children's television with a resume that includes Thomas & Friends, Oggy and the Cockroaches, Horrid Henry, and Noddy in Toyland. FMV WORLD: How did you start doing video games? ALLAN PLENDERLEITH: I got into apps. Right at the beginning of the app boom, when apps were cool and people used to show each other their new apps, if your game wasn't completely awful it was quite easy to get onto the charts. You could stay in the Top 10 for quite a while. That was really how I got started in the interactive space. 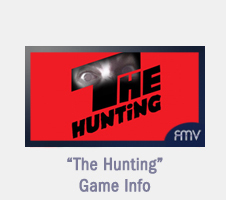 All the FMV stuff started when I made a game called The Hunting. I had this crazy idea one day when I was watching my daughter watching a television show on the iPad. She saw a door and she swiped the door and of course it didn't open. I thought, "Wouldn't it be cool if the door opened when you swiped the door?" Then I had this crazy idea to do The Hunting. THE HUNTING was a live-action, first-person zombie game released in 2013 for iOS. It was shot entirely on an iPhone. I've looked, but it doesn't seem to be available anymore. Yeah, we've pulled it from the App Store for now as we might do a remake or reboot version. Then you followed that up with THE BUNKER. I thought it was incredible. With FMV games, if there is subpar acting or subpar sets or visual effects, it just reinforces the negative perceptions of the genre. When I was playing THE BUNKER I thought, "This really gets it right. It's really well done." Adam Brown (The Hobbit, Pirates of the Caribbean: Dead Men Tell No Tales) was extraordinary. Adam was so great to work with. He's not a gamer. 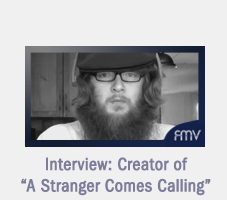 He has no idea what FMV is or point-and-click adventures. He just treated it like a movie gig really. You know, actors are very good at shooting things in the wrong order. He would go from one scene, where's he's just opening a drawer full of socks, to pushing a bone back into his broken arm and screaming his head off. That scene was agony to watch! You really buy it. I had to say, "Are you alright?" That scene really makes the case for live-action scenes in video games. I really don't think you could evoke that same emotion within the audience or player if you replaced that with a computer-generated character. Adam really did a great job of conveying the pain he was feeling. Exactly. I mean, I couldn't watch it, even though I knew it was not a real arm. We had this fantastic prosthetic arm with blood and pumps. There were a lot of people involved in that scene, but it's Adam's performance that really sells it. It really does. I'm a big PENNY DREADFUL fan and when I saw Sarah Greene was in it, I was instantly sold. How do you approach actors like Adam or Sarah with the idea of doing an interactive film? Well, Adam is interesting because I was looking and looking for the right actor for the part. I didn't think of him as I was watching The Hobbit. I thought of him when I was watching the DVD extras of The Hobbit and he appeared as himself. He didn't have the wig on, he didn't have the big nose and he was just Adam. He was talking and I just thought, "He's John. He's the one," not thinking for a minute that we would be able to get him. So we got in contact with his agent and said, "Look, it's a video game but it's a film and you'll be in the film. You're not going to be a voice in the video game, you'll be the star." Actors love that. They love it if they're going to be the star (laughs). In terms of just being the star and being our focal point, he was right in there. We filmed a trailer with him way back in July of 2016. We basically got the funding through that trailer. That's when we approached Sarah Greene and said, "You're playing the part of the mother. It's no ordinary part." She's done a lot of voices in games. She's done The Witcher 3 and an Assassin's Creed game, but for her to appear as an actor was really exciting for her. Again, she's not a gamer either. She just treated it like a film. She just knocks it out the park as well. She's so good. She's one of the best actresses I've ever seen. She would even try scenes in so many different ways, which is just a subtlety that you get with actors that you don't get with animated characters. This is the whole thing. When I was working with Sarah, I would say to her, "You're at an 8 out of 10 there on evil and we want you to dial it back to a 2." And her whole face would change to a 2. And you're like, "That's it. That's the one." She would have that sadness in her eyes. She was just telling John all the things she had to do and there was this inevitable sadness in her eyes as she knows what she's doing. She knows it's wrong but she has to do it for her son. And that's quite a complex emotion to convey. There are mixed emotions there. To try and convey that with an animation or motion capture or whatever is pretty tough. And like you say, if an actress is good, she'll just sell it for you. This was a really high-quality production. Can you tell us about the production process? Pre-production involved 6 months of writing. We already found the location and were getting all the actors in place. Every single shot was storyboarded by me, so we could turn that into a shooting schedule. We got a great production crew, we got great producers who have done many, many projects over their careers. You really need that. We were basically filming The Bunker before we knew it would work in Unity. We were kind of guessing. But we had a window where Adam and Sarah could work before she went back to Penny Dreadful and he went back to Pirates of the Caribbean for reshoots. So we had a very small window where we just said, "Okay, we're gonna shoot this." We shot the whole film in 15 days. And that's to get a 3 hour game, so it was a really tight 15 days. Every single day. There was no mucking about on set. No hijinks. There was about another 4 or 5 months after that where we were doing the editing, the color-grading, all the sound design, all the composition for the music and building the game. So the actual asset building for an FMV game like The Bunker is remarkably quick. It would take months and months for artists (on a traditional video game) to design the characters, the backgrounds, the modeling, and the animation and so on. Whereas everything you see in the game was done in those 15 days. Are you familiar with the older FMV games? Yeah, the really old ones. Phantasmagoria, The X-Files, and Night Trap. I've played quite a few of them and I actually used to love them, I have to be honest. Now when I look back I go, "Oh, okay. That's a B movie...or a Zed movie" (laughs). The performances are not great, but you were getting game studios making movies and they had never made movies. It was like a student making their first film. You learn a lot when you've made a few bad films. You learn what to do and what not to do. But we've moved on from that. It's funny, when we were talking about The Bunker we were being compared to those games. We were in a very tiny genre that has a huge cult following. 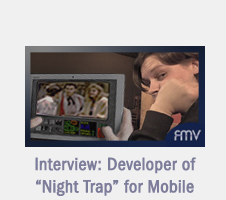 People immediately said we were an FMV game and we didn't even think about that. When I did The Hunting, because that's an app, that world doesn't know what the phrase "FMV" means. So it was never mentioned in any of the reviews, it was just a live-action horror game. Quite simple. 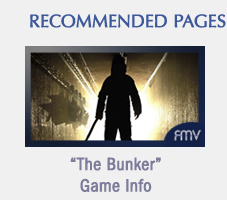 But as soon as we released The Bunker for PC it became an FMV game, which is interesting. And we thought, "Oh, yeah. Of course it is." We just hadn't quite realized it. I think it's a good shorthand, but it's such a weird term to use for what The Bunker is. Everybody knows what it is, but everybody knows it's such a weird term. I don't get why we still use it. It's just movie footage. Interactive movie game. That's what we call it. It's a movie game. I still don't really know what to call it. Very few games with 100% live-action are released for modern consoles. Did you always plan on releasing THE BUNKER for consoles? Yes, it was always going to be for all platforms. We developed the whole game in Unity, so it was very easy to do a console one. There were two engineers from Wales Interactive who helped us do the user interface and build the game. They also published the game for consoles. The mobile one will be coming out in about a month. So yeah, It was designed from day one to be multi-platform and the game you get on Playstation is the same one you get on PC. The only difference with the mobile version is no arrow, because it's touch. What's next for Splendy Games? We've got a big slate of projects that we want to do that increase in ambition over time. The next one is an investigative thriller. At the moment I can't give too much away, but we're looking for funding for that right now. It's a five-part episodic "Silence-of-the-Lambs-Meets-Seven" type thriller with a very strong female lead. It's much more ambitious with a multi-strand, multi-part narrative. If you like The Bunker you'll definitely like this. That sounds fantastic. I love that idea of interactive episodic television. Telltale Games has that kind of model in place, but there's no live-action. Exactly. That's the kind of thing we're going for. It's a Netflix-series type thing with a really good story. It may become one episode, but the actual story is set over 5 days so it'll be 5 chapters to the main game which will last over 5 hours. That's what we're going for, so watch for that. Oh! The other thing I wanted to mention was we've turned The Bunker into a short film which is 32 minutes. It's edited down, obviously, but the actual core story is still there. We just got into the Cannes Film Festival. It'll be the first video game ever where the footage from the game ended up at a major film festival. 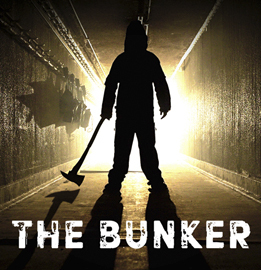 For more information on The Bunker and Splendy Games, visit the OFFICIAL WEBSITE.